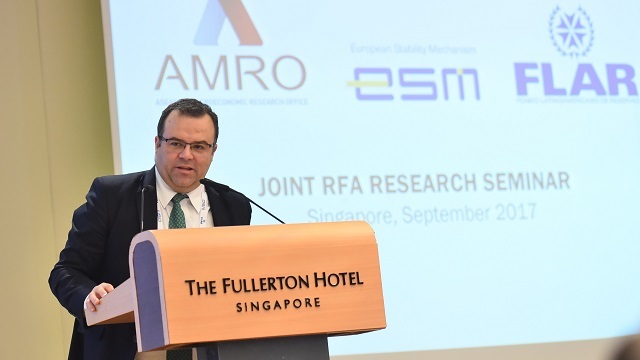 The inaugural Joint Regional Financing Arrangement (RFA) Research Seminar co-organized by the ASEAN+3 Macroeconomic Research Office (AMRO), the European Stability Mechanism (ESM), and the Fondo Latinoamericano de Reservas (FLAR), will be held on September 7, 2017 in Singapore. 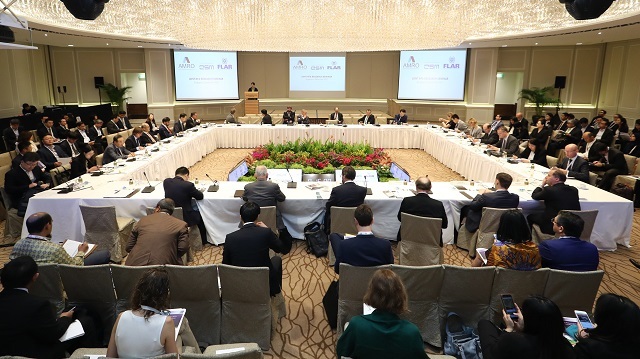 The seminar is an annual event aiming at bringing academics and institutions together to discuss key issues pertaining to global and regional financial stability. 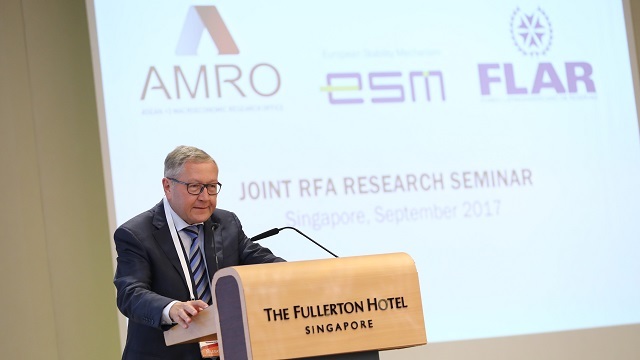 AMRO Director junhong Chang and ESM Managing Director Klaus Regling will deliver the opening remarks and keynote speech, respectively. The full-day event will comprise three sessions. The first session, led by AMRO Chief Economist Hoe Ee Khor will focus on the methodology, current practices and challenges pertaining to economic surveillance. Chaired by ESM Chief Economist Rolf Strauch, the second session will discuss lessons learned from the past for future crisis prevention. The last session, led FLAR Director of Economic Studies Carlos Giraldo, will discuss crisis management with a focus on liquidity provision and moral hazard concerns. Among the discussants and speakers will be renowned academics and experts, representatives from international, regional and national organizations, and the private sector. Economic surveillance is key to identify main signals that can potentially lead to a crisis. RFAs are keen to strengthen their capacity of economic surveillance with the contribution from academics. This session will focus on the methodology, current practices and challenges pertaining to economic surveillance, with a particular interest in tools on sovereign vulnerability assessment, early warning signals, current account sustainability as well as fiscal sustainability. A number of regions, including East Asia, Latin America and Europe, have gone through crises of different types in the past. This session will contribute to the understanding of the different types of crises (e.g. currency crisis, bank runs, sovereign debt crises, etc. ), and how to deal with them. Different RFAs are in fact set up to deal with different crisis types; this also explains the variety of instruments available at different RFAs. The session will also address ways to deal with spillovers across countries and regions and from global financial markets. In times of crises, swift reaction for crisis resolution is important. At the same time, to prevent facility shopping and to contain moral hazard risks also matter. This session will discuss how to address these concerns, using conditionality or other instruments. 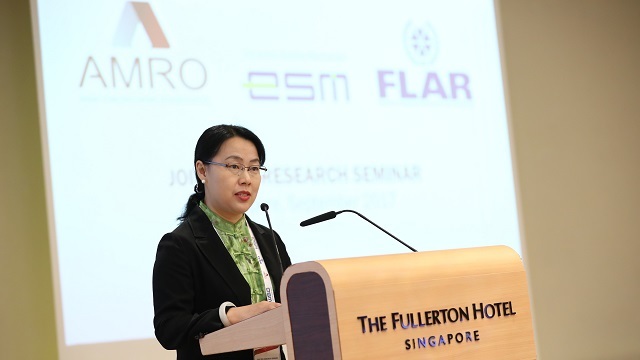 SINGAPORE, September 7, 2017 – Stronger cooperation among the different layers of the Global Financial Safety Net (GFSN) is crucial to prevent and contain future crises and safeguard global financial stability, participants at an international research seminar held today in Singapore highlighted. Jointly organized by ASEAN+3 Macroeconomic Research Office (AMRO), the European Stability Mechanism (ESM), and the Fondo Latinoamericano de Reservas (FLAR) – the 1st Joint Regional Financing Arrangements (RFAs) Research Seminar is an annual event aiming at bringing academics and institutions together to discuss key issues pertaining to global and regional financial stability. Topics included economic surveillance, crisis prevention and management. Among the discussants and speakers were renowned academics and experts, representatives from international, regional and national organizations, and the private sector. Participants agreed that in crisis management, prevention was better than cure. Therefore, sound economic surveillance was key to identify main risks that could potentially lead to a crisis. 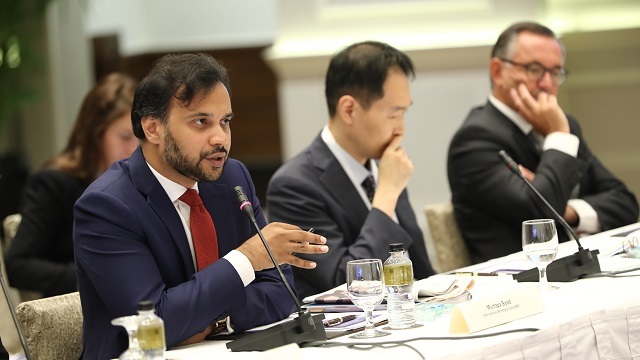 To strengthen the capacity of RFAs and collaboration among them and with the IMF in this field, panellists and participants exchanged views on the methodology, best practices, and challenges pertaining to economic surveillance, both at the country and regional levels. In particular, the panellists looked at the best practice of early warning toolkits, which include indicators to monitor individual economies, and discussed how to further enhance these toolkits. RFAs were also encouraged to better collaborate to develop their own surveillance frameworks to prevent possible crises in the future. The IMF’s risk assessment frameworks can provide a useful reference. Experience shows that different regions, including East Asia, Latin America and Europe, have gone through crises of different types. These include currency crisis, bank runs, and sovereign debt crises, all of which required a variety of instruments to deal with. In fact, different RFAs were set up to deal with different crisis types. The seminar discussed how to deal with large economic shocks of different types and contain regional spillovers based on past crises in Asia, Latin America and Europe. In times of crises, a swift reaction is quite important for crisis resolution. At the same time, as external liquidity insurance providers, RFAs should encourage the implementation of proper and timely measures to correct macroeconomic imbalances, contain moral hazard risks, and prevent facility shopping in case of multiple financing available. This represents an important challenge for the global financial safety net. The seminar discussed on how to address this challenge, through conditionality and other instruments. 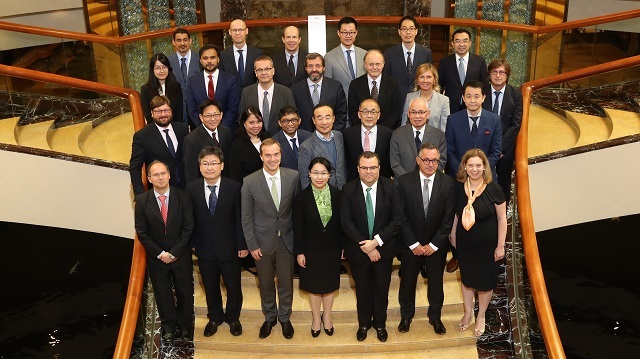 The 2nd High-Level RFA Dialogue will take place in October in Washington, D.C., which will focus on the cooperation among RFAs and between RFAs and the IMF. More than 100 participants attend the seminar. AMRO Director Dr Junhong Chang delivers opening remarks. ESM Managing Director Klaus Regling addresses the keynote speech. Carlos Giraldo, Economic Studies Director of FLAR, delivers the closing remarks. Murtaza Syed, Deputy Division Chief of Advanced Economies and Multilateral Issues, IMF discusses the topic of economic surveillance. Distinguished speakers and delegates, and participants from RFAs at the event.